Here is just a couple of idea's on how you can spend your time with us at Skytrek Willow Springs Station - remember there is so much more to see and do in the region but this is just a starter to help with the planning of your trip. ​On your trip to Skytrek Willow Springs why not call in and check out some of the interesting and unique products on the way. If coming from the south we highly recommend Jeff Morgan's Art Gallery or a coffee in one of the local cafe's. Get your maps and information from the Hawker Visitor Information Centre and fuel up before heading further North. ​Enjoy a Full Day 4WD Self-Drive Experience in your own vehicle, or speak to us about our approved Local Guided Tour Operators, taking you around one of Australia's most diverse and exciting 4WD tracks. Then trek on to the famous Prairie Hotel at Parachilna for lunch offering a 'Feral Feast' and nice cold 'Fargher Lager,' or if its too early in the day push on to the historic township of Blinman and have a feed at the North Blinman Hotel or the Miners Crib. After lunch join an unforgettable Underground Sound and Light Experience in the Blinman Heritage Mine. Learn about the hard times of mining Copper in the 1800's and the techniques used without the technology we have today. 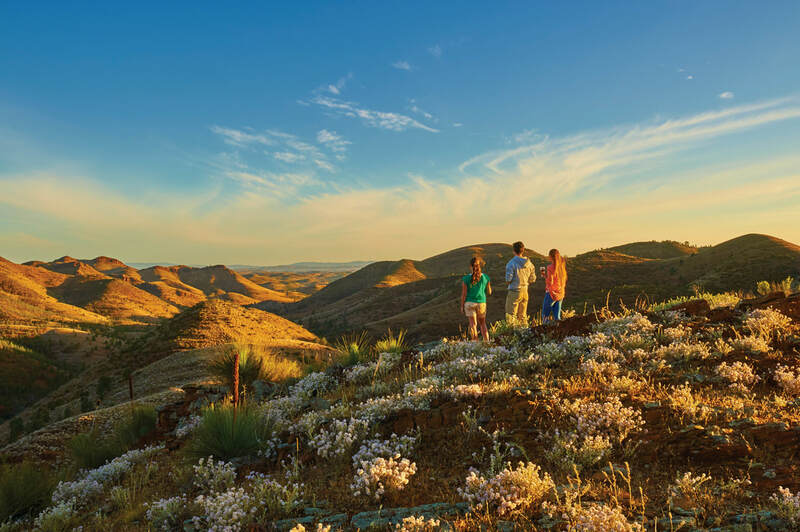 Finally return back to Skytrek Willow Springs and end your day with a stunning sunset at Stokes Hill Lookout - the perfect way to finish your short trip to the Flinders Ranges. After a big day of travelling why not use your first day at Willow Springs as an opportunity to relax and take in the scenery around your campsite or accommodation. We recommend you go for a walk along one of four marked walking trails located on the property offering diverse landscapes and unique attractions such as Natural Springs, Indigenous Petroglyphs and the stunning Yacca Lookout. discover the challenges they experienced through drought and neighbours. A trip to the Flinders Ranges wouldn't be complete without a walk at Wilpena Pound. Choose from a variety of easy, medium and hard walks varying from 3hrs - 9hrs offering awe-inspiring views of the famous Wilpena Pound. Our top choices are Wangarra Lookout, Mt Ohlssen Bagge or if you are looking for a challenge why not try a full day trek to St Mary's Peak (the tallest peak in the Flinders Ranges). 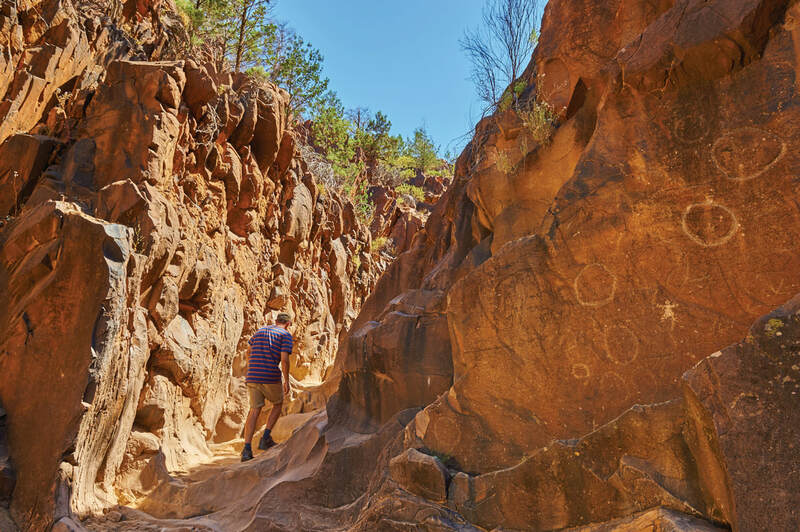 If you still want to add more to your day maybe you could consider visiting Sacred Canyon or Arkaroo Rock to see some of the region's best preserved Indigenous Petroglyphs/Painting and get a better understanding of the local Culture. Or alternatively why not take a short stroll to the Cazneaux Tree, the perfect place to reflect on the age of the environment around you. ​​Use this opportunity to experience some of the major attractions of the region as you start your day out in Bunyeroo and Brachina Gorges. Be awe-inspired by the unique landscape whilst keeping your eyes open for the energetic Yellow Footed Rock Wallaby. Then trek on to the famous Prairie Hotel at Parachilna for lunch offering a 'Feral Feast' and nice cold 'Fargher Lager' or if its too early in the day push on to the historic township of Blinman and have a feed at the North Blinman Hotel or the Miners Crib. 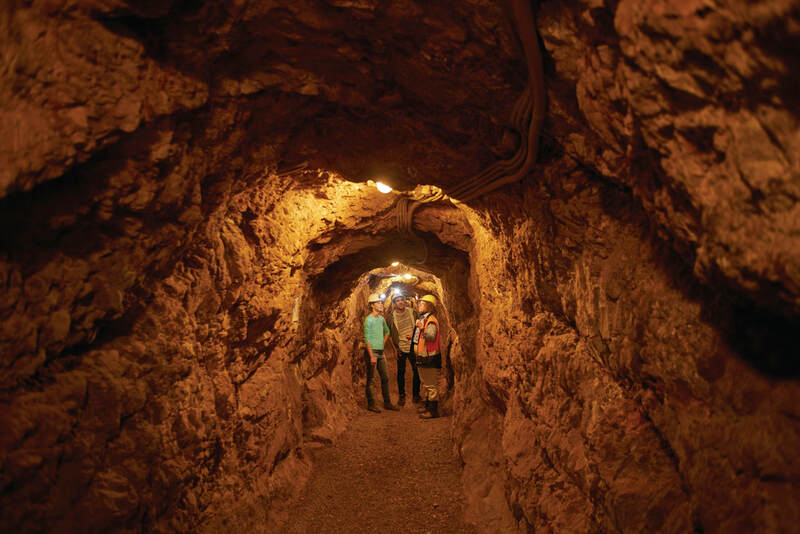 After lunch join an unforgettable Underground Sound and Light Experience in the Blinman Heritage Mine. Learn about the hard times of mining Copper in the 1800's and the techniques used without the technology we have today. Finally return back to Skytrek Willow Springs and end your day with a stunning sunset at Stokes Hill Lookout - the perfect way to finish your short trip to the Flinders Ranges. 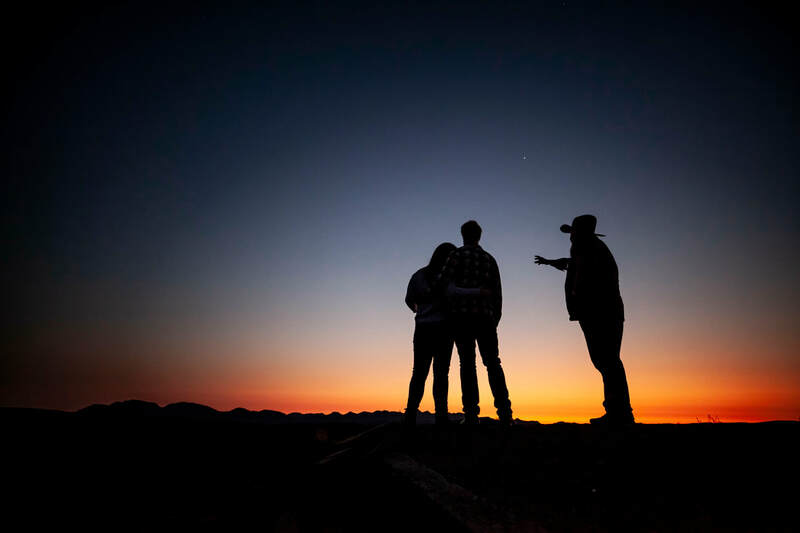 ​We believe you should then finish the day with an unforgettable experience on the nearby Stokes Hill Lookout with 360° views of the Flinders Ranges and the sun setting directly behind Wilpena Pound. ​Enjoy a Full Day 4WD Self-Drive Experience in your own vehicle or speak to us about our Guided Tours taking you around one of Australia's most diverse and exciting 4WD tracks. 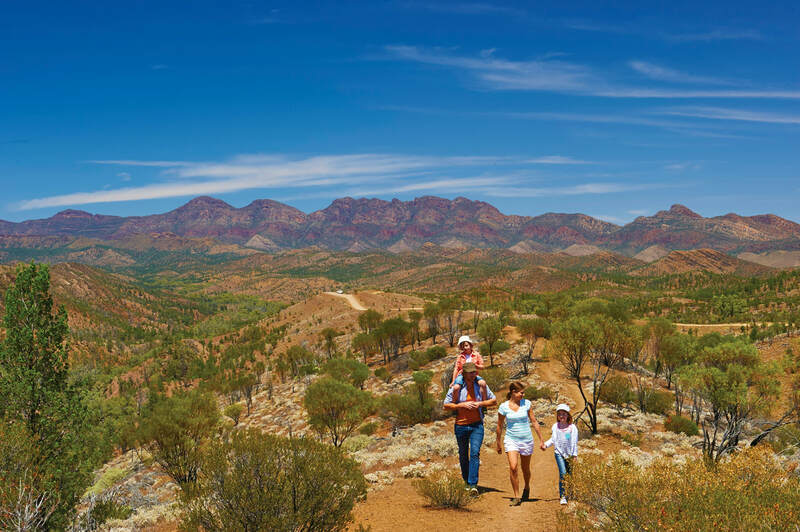 ​​We think one of the 'must do's' of the Flinders Ranges is Bunyeroo and Brachina Gorges. Another leisurely full day out that we recommend starts you off by heading to the historic township of Blinman. in Parachilna for a 'Feral Feast' lunch stop. This internationally renowned Pub will have your taste buds tingling as you try some of the local 'feral foods' and of course wash it down with a nice cold beverage or two. ​We recommend you then return back to Willow Springs via Moralana Scenic Drive highlighting the western walls of Wilpena Pound and showcasing the Elder Range and Chace Range. Now that you've seen most of the local area by ground why not consider seeing it from the air to give you an overall understanding of our unique landscape. Choose from several scenic flight operators including Fargher Air, WrightsAir, Chinta Air and Hawker Bush Pilots to witness the buckling and folding of the Flinders Ranges. If you haven't had enough of exploring the area why not consider another private 4WD track in the afternoon from surrounding properties such as Upalinna Station, Alpana Station, Merna Mora Station or Rawnsley Park Station - or alternatively venture further and look at the many 4WD tracks in our local region. ​Then return to Willow Springs to start packing up ready to head off the next morning.